Anyone with the cash can buy a recreational vehicle. Most can be driven on the street without any additional training. But if the owner hasn’t mastered the art of avoiding RV wrecks and disasters, all bets are off. Two RV driver education experts in the field explain why the price of a weekend RV driving school will cost you far less money and heartache than repairing a wrecked rig. We drove into the Utah Forest Service campground and found that perfect every RVer dreams about. It was so peaceful and scenic that we weren’t ready to leave on check-out day, so we extended our stay. But our holding tanks needed emptying and our water supply replenished, so we packed up and went to town. A couple hours later we returned to the same spot. As always, I got out of the truck to guide my husband into the back-in site. But our rig was at an odd angle, which made the parking job a tedious chore. The large boulder on our truck’s right rear passenger side didn’t make things easier as he maneuvered back and forth to squeeze past the obstruction. When I saw that he was getting too close and yelled to warn him, the throaty roar of our Dodge was louder than my screech. And before I could flail my arms to say “STOP!” the sickening crunch of metal on granite filled the air. We neglected to walk around that spot to gauge the distance of the rock to our truck. Had we done so, our truck would still look brand new. 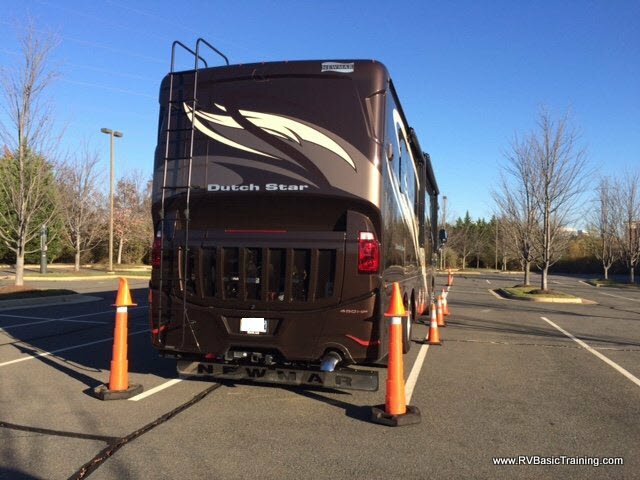 RV Basic Training teaches common maneuvers for all RV sizes. Ten years ago Lewis launched his school to help RVers avoid RV wrecks and disasters like ours. Since then, the enthusiastic instructor says he’s seen every kind of RV wreck under the sun. Usually people call him after an accident has happened, eager to get their confidence back and continue RVing. The list grows longer with other accident factors, like over-inflated tires and overloaded RV cargo, he says. RV Driving School classes are for everyone, especially reluctant women RV drivers. Despite the large ticket price to buy RVs, most RVers take the “It won’t happen to me” approach when getting behind the wheel. Young RVers and elder retired seniors alike typically don’t think RV wrecks and disasters are other people’s problem. 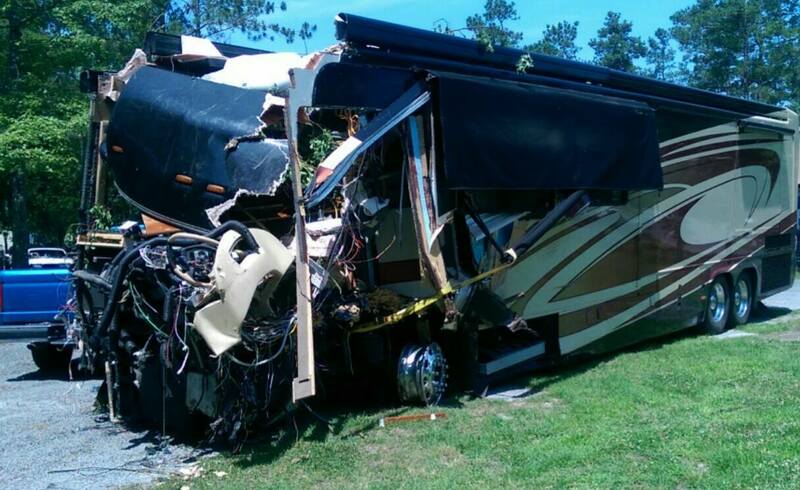 They usually don’t seek RV driver education training until something bad happens. “We see a variety of reasons why folks come to us for help. Sometimes it is the realization that the RV is more of a challenge than originally anticipated.” Mayleben says. His students are mostly comprised of drivers over 55. And although younger people are buying RVs each year, most don’t feel they need the training. Women are a fast growing demographic in RV driving schools like Maylben’s. More are learning how to drive RVs, and instructors agree that the investment is especially valuable for them. If a woman is traveling with a partner who does the majority of the driving, knowing how to drive their RV can make life much easier if an unexpected health problem happens to the main driver. “We train an awful lot of women who have been put in that position because of a health issue with the husband,” says Lewis. Give RVs the Respect they Deserve. In any good RV driving school, students have the choice to learn RV driving tips in a classroom setting as well as one-on-one lessons with professionally trained instructors. The road lessons can be provided in a RV owned by the student, or in some instances, rentals are provided by the school itself. 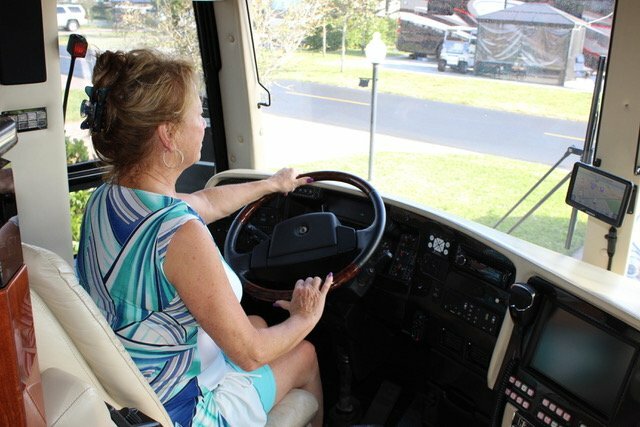 New driver lessons are offered as well as refresher courses for more experienced RVers. Some training sessions are just one day while others are multi-day. With so many education options, avoiding RV wrecks and disasters is totally possible. We have a pull 26 foot pull trailer and we always use wakie talkies to communicate when backing into an RV spots. We found that this is the way to go and saves from having a divorce and damage to your RV or others around you. 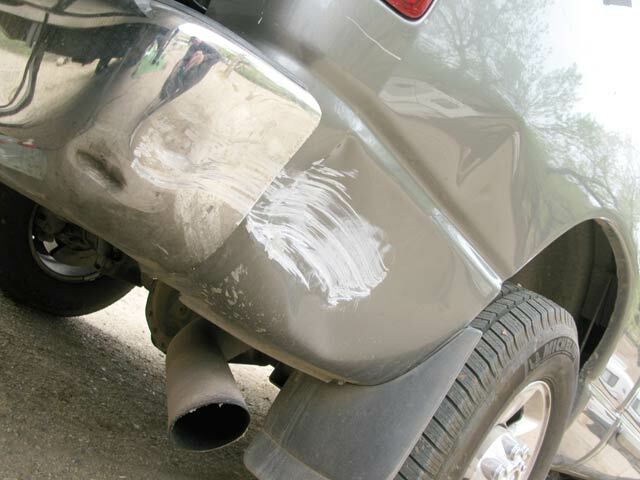 Most times you can also use your cell phones to talk to each other as you are backing up. Cell phones can have a slight delay so rdios are the way to go. A problem with Walkie Talkies, or phones, is that they’re a distraction for the driver.. just another thing to worry about. We have a policy that one of us is always outside the TV, even after the GOAL, and we have a simple set of hand signals. Don’t be afraid to to do a lot of walking-back-and-forth, to see what’s happening Back There, then to explain the next step to the driver, then to make sure it works out as planned. Rinse and repeat. Never hesitate to pull out and start again, if you have to. The driver doesn’t need to talk; just follow the spotter’s commands. If the driver needs clarification it’s easy to stop movement and ask. We find our walkies to be indispensable. I agree with you. That’s how we do it as well! GOALS. Get Out and Look, Stupid. Most of our largest vehicles are driven by those who have slower reflexes, aged-eyes, and maybe health issues. Scary. I’m single, female, over 64, driving a 34’ 1995 class A GulfStream Scenic Cruiser. GOAL is for real. Turn on flashers and walk around. When backing in camp site after dark, I laid out a battery op string of patio lights as runway landing lights. Tilt my mirrors. Works for me. Worst issue was long rear end swinging too wide leaving gas pump; clipped corner on yellow post. Think ahead – plan your get away before every exit. As a fellow female solo driver; great idea for using the string of lights. I also had rear bumper motion sensors added (I don’t tow anything) and a night vision rear camera. Where is Mr Mayleben’s Driving School? Does he have an online course? We always have someone out of the vehicle with a radio or cell. Both have delay issues, with radios you need to wait a second after you “push to talk.” Driver listens and stops the vehicle if they don’t understand. We have 4 LED lanterns that we put in the space before we ever begin to back in after dark. I wish there was a driving school out west, we have looked and haven’t found anything. While I am comfortable with the driving, I believe the time they spend in “avoidance” is well worth the cost. Doh! Thanks for catching that blooper! You’re right, you probably have more experience driving a large vehicle than most RVers. Hope you get the chance to take a course the next time you travel to an area with instructors.